If you needed an excuse to make VSCO Cam part of your iPhone photographer‘s toolkit, here’s one. On Thursday, developers issued a substantial update to the free iOS app which brings a thoroughly redesigned user interface. Now a universal app for all form factor iOS devices, VSCO Cam runs natively on iPads and brings out full support for iOS 8 and the new iPhone 6 and iPhone 6 Plus resolutions. This release is packed with half a dozen interesting new features, among them integration with VSCO’ new mobile publishing platform dubbed Journal. Download VSCO Cam free in the App Store. Journal allows you to publish a set of photos on the web, complete with captions and gorgeous themes. Anyone with a desktop or mobile browser can then enjoy your Journal stories. Unlike the company’s existing Grid publishing platform, Journal is strictly mobile so you’ll need to use the iOS app to create Journal entries. In the future, users will be able to enrich their Journals with content from Vimeo, YouTube and SoundCloud, said developers. 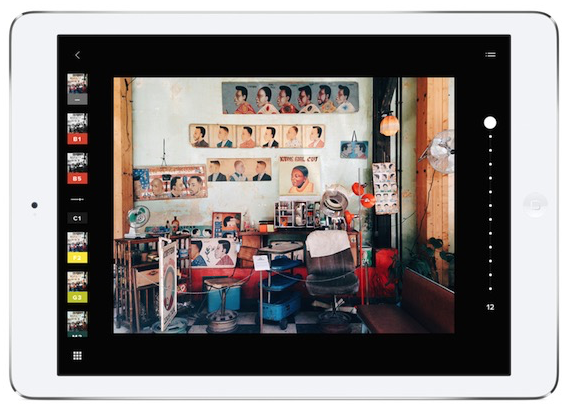 And if you own an iPad, VSCO Cam now runs natively on the Apple tablet and gives you the complete set of features to edit photographs on 7.9 and 9.7-inch canvases. Here’s what the UI looks like on an iPad. You don’t need to be concerned about transferring your photos between the iPhone and iPad edition of VSCO Cam as the software now comes with an aptly named ‘Sync’ feature which lets you shoot, edit and share your snaps across VSCO Cam editions for iOS and Android. Throwing in a nice bonus, developers said that mobile photographers can now take advantage of its brand new web uploader tool for adding images from DSLRs and other sources into your VSCO Cam library using any desktop browser. Check out VSCO Cam 4.0 in action. Sadly, this release of VSCO Cam lacks a photo extension that would make it possible to edit shots using VSCO Cam features right inside the stock Photos app. The 88.4-megabyte universal app requires an iPhone, iPad or iPad with iOS 8.0+. Additional effect packs are available through optional In-App Purchases. The “Levi’s Commuter,” “Analog Archetype,” “Hypebeast / HB” and “Street Etiquette” packs are currently available at no cost and I wholeheartedly recommend grabbing them before developers change their mind.